I suppose there are ideas that truly need to percolate a while. Whether it’s out of necessity (life events) that one has to wait until he/she can actualize an idea into reality, or whether it’s a host of artist blocks that lengthen the gestation period, I’ve certainly experienced this long term percolating, and there are benefits. 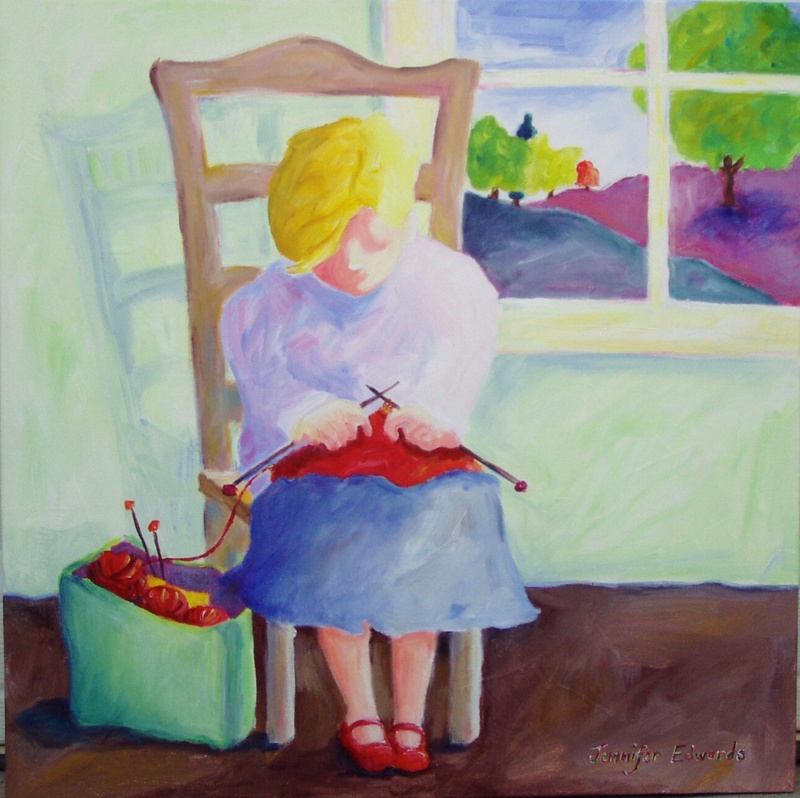 I sketched out several “knitter” inspired drawings two years ago, and wanted back then, to translate them into larger acrylics on canvas. I even wrote about this idea all around the original sketch. Not sure why I never tackled it then. But I have brewed over them in my head, auditioned them (mentally) in various other media and styles, none of which “took” to me. The subject matter has grown, as well as a more sure sense of purpose and need to create them. Dare to stay where you are! I like the original sketch so very much as the background colors are so pleasing and the line work so fresh looking–then the final one has a different look–and has the additon of the outside view, too….to me it shows how the passage of time often changes our perceptions—congratulations on doing what you wanted to…! 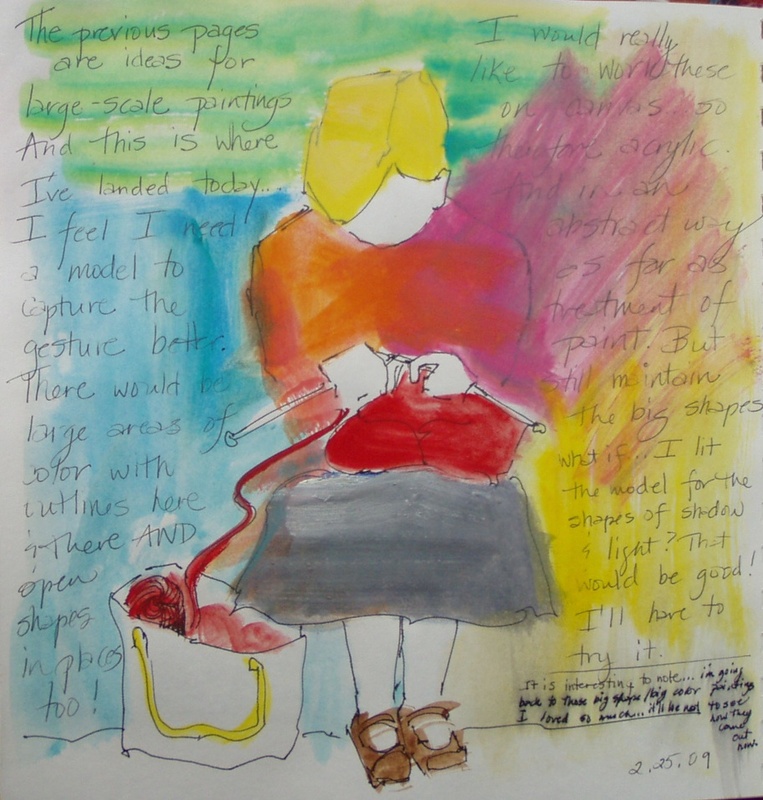 I love the colors in this-the red mary janes, the blonde, the yarn–perfect combination. Your work shows joy—I am inspired by it. Love them =) They share the same expressions and feelings, and only style separates them, but still retain the originality! Beautiful painting. Very comforting to look at.